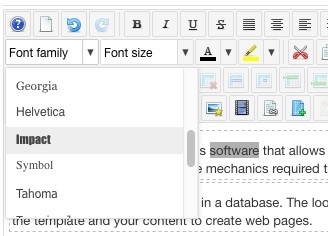 The editor includes options to set the Font Family, Font Size, Colour and Background Colour for text in the article content. To set the font-family, select some text, then select the required font from the Font Family list. To set the font-size, select some text, then select the required size from the Font Size list. To set the font colour, select some text, then select a colour from the Font Colour drop-down. Click on More Colours to open a colour picker dialog to specify a custom colour, or to select a Web Colour, Named Colour or a colour used by your template. To set the background colour, select some text, then select a colour from the Font Background Colour drop-down. Click on More Colours to open a colour picker dialog to specify a custom colour, or to select a Web Colour, Named Colour or a colour used by your template.